Marcus Tober (@marcustober), the founder and CTO of Searchmetrics, is in from Berlin. 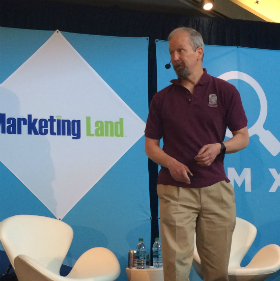 He tells us that, in a nutshell, search engines like Google are trying to filter out all the junk, and traditional ranking factors are dead. Is SEO dead, too? When Google rolled out Panda and then switched to HTTPS, all the people screamed SEO is dead and now we need to be creative. But if you search and there are results, there is still something to reverse engineer. Tober looked for the keyword in the title tag on more than 30,000 top-ranking pages. In 2015, 75% had it. In 2016 only 55% had it. Hummingbird and RankBrain are responsible for this. He found 7% less usage of H1 tags. But keywords in H1 tags are down by 10%. 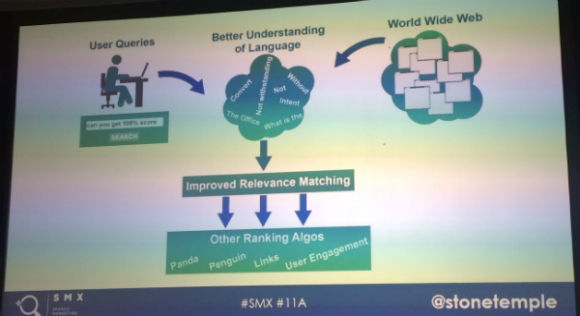 There is a legend that if you have longer content, you will have better rankings. However, in 2016 the top pages had an average of 1,633 words. In 2015, the average page had 1,285. As for internal links on the page, in 2015 he saw average internal links of 150. In 2016, it was 126. This is the first time this number has decreased YOY in Tober’s studies. 92% of business purchases start with search. 81% of shoppers research online before buying. We must analyze industry by industry for intention. 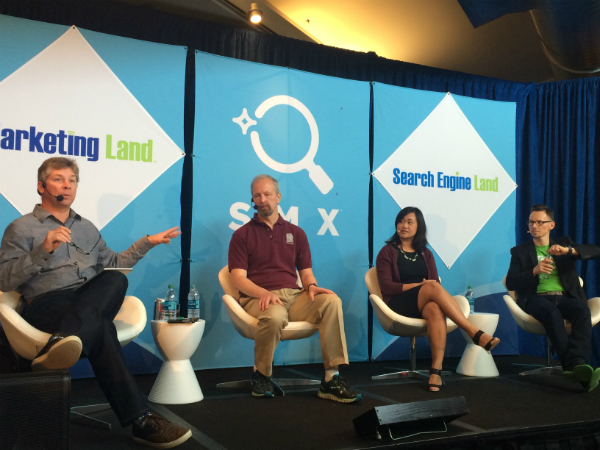 Each industry has to deal with different search intentions. If the industry is health, the searcher is interested in the most valid information. In another industry, however, the searcher is looking for the best offer. If you search for “security camera system,” 10 out of 10 search engine Page 1 results have an add-to-cart button above the fold. This is a dynamic relevance factor. However, if you search for “security system,” only 3 out of 10 results have shopping carts. Other results are for vendors (but without shopping carts), and the last four just give information. 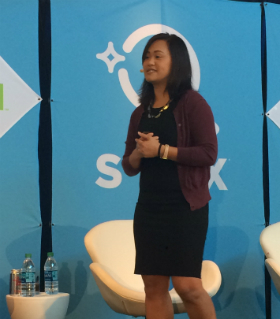 Leslie To (@itsleslieto), the director of SEO at 3Q Digital, quotes Heraclitus: “Change is the only constant.” To holds that no quote better describes the SEO industry. Why, then, do so many SEO projects focus on meta data and body copy optimization? These things still matter, but how much do they matter? How much does exact match keyword targeting matter in title tags? CTR is related to meta descriptions and has been thought to impact rankings. Does it really? Is there a diminishing return on content investment? Based on To’s research, pages between 500 and 600 words had the best rankings. However, this varies by industry. You should study how many words your pages have and how that relates to their ranking in order to find your own sweet spot. We can’t write title tags based on an exact keyword — it has to be about keyword themes and focus on the goal of the page and finding the theme that encompasses it. URLs with phrase match often ranked better, according to her research. After adding meta descriptions to 1,500 pages, To tracked them over time. After the initial release, the CTR soared. There was a .33% increase in CTR, BUT a –.29 change (drop) in average position. RankBrain is getting better every day, but it’s still not there. As RankBrain gets better at interpreting searches, the pool of keyword permutations will slowly shrink. 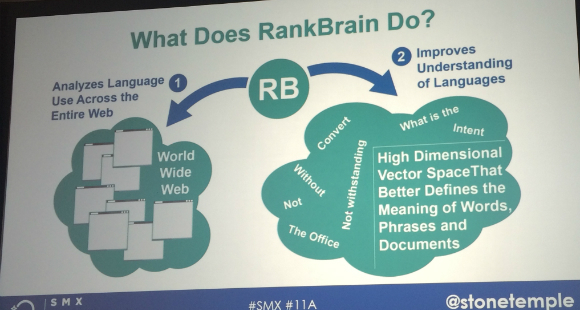 Because of this, you’ll also have to get better at figuring out implied meanings of keyword searches in order to take advantage of RankBrain’s conflating abilities. Even though it’s the third most important ranking factor, it’s unclear how we can optimize for it. Eric Enge (@stonetemple) is the CEO of Stone Temple Consulting. Does getting a featured snippet increase traffic? In some tests, traffic doubles to sites with featured snippets. Stone Temple published five videos in May 2015 with transcripts of clear steps in them. After they submitted the URLS to Google Search Console, two-fifths of the videos earned featured snippets! Enge explains basically what Google’s RankBrain does, with the result that it improves the search engine’s ability to understand natural language and then provide more relevant results. Google’s second mobile-friendliness update, which rolled out in May 2016, was almost a non-event in terms of its impact. 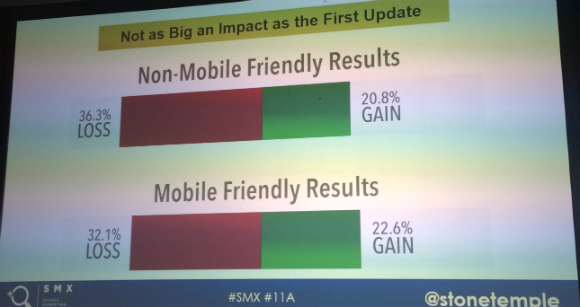 Furthermore, the total percentage of mobile-friendly results increased by only 1% after Update 2. This update is still important, though. It’s an indicator of Google’s confidence in the concept of a rankings boost. It will likely be followed by more updates. And future mobile ranking updates will include other factors, such as page speed. In a hangout Enge participated in on March 23, 2016 with several others including Google’s Andrey Lippatsev, the following exchange went down, revealing Google’s continued reliance on links as one of the top two ranking factors. Hello, Kristi..!!! I don’t know how to appreciate you and your content writing. I am really you the big fan. Hope that you always rock with your writing and got a lot of appreciation from the people’s ahead. This is so good and real. The quality matters instead of taking so much old techniques in SEO. With SEO, Pattern of searches are also changed. This article is so good to understand what is SEO industry is thinking and what is real. Thanks you for Research Kristi!! Hey Maze :) I, too, didn’t agree with Tober’s definition of “good SEO” and “bad SEO.” It would have been more accurate to called it “new SEO” and “traditional SEO.” OF COURSE we should be doing the basic steps of keyword in domain, title, H1, etc. — what he listed as “bad SEO.” As for his “good SEO” (content quality, user intention, content experience) — these are great. And you have to think about them as an SEO. But you can’t throw away the tried-and-true basic tactics! Nice information on ranking factors but i can’t understand the metrics of content marketing obtained links & it’s positions! I strongly disagree with your bad seo vs good seo! Thanks, Chawki. I don’t know if I’d say that any of this is “easy” but content and internal linking are definitely high-value signals. Thanks for your comment! I liked the slideshow and I learned that a website with high quality content and good interlinking can easily outrank a website with a lot of backlinks. Nice article in seo we have to be really up-to-date. Mayank, SEO and content go hand in hand. Users first! Content marketing is the new way to look at seo and many still make mistake by following old traditional methods. YEAH EVEN I HAVE NOTICED ALL THESE CHANGES IN SERP.SPECIALLY I SAW NOW A DAYS CONTENT IS MORE IMP THEN TITLE EVEN… EVERY PAGE CONTENT IS PLAYING MAJOR ROLE IN SERP. Lawrence, the -.29 drop in average position is after adding meta descriptions — yes, that’s how I read To’s statement. To clarify, is the –.29 change (drop) in average position she refers to after adding meta descriptions a -.29% drop? ?